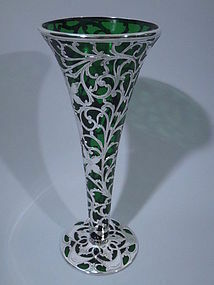 Green glass trumpet vase with silver overlay. Made in America, C 1900. Circular and flat foot and everted rim. Floral and foliate overlay on body. Snazzy swag and trefoil overlay on foot. Central asymmetrical cartouche with engraved monogram. 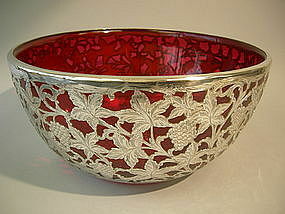 A traditional form enlivened with color and ornament. Excellent condition.